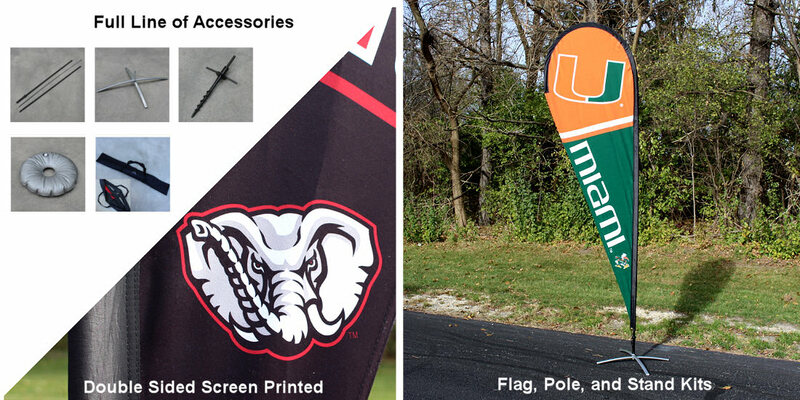 Our college teardrop flags are a unique way to show your team allegiance! Use them for marking your tailgating spot, displaying at the end of your driveway, yard or porch, and for many other uses. These College Teardrop Flags measure a large 9' (height) x 3' (wide), are made of thick 300 mil polyester, and have double sided screen printed team logos so the logos and lettering are viewable and readable correctly on both sides. We offer these teardrop and feather style flags as "flag only" and in "kit" packages . If purchased as a kit, the three-piece fiberglass pole is included along with our sturdy metal flag stand. When fully assembled, these teardrop flags stand a huge 10 feet tall! A full line of accessories are available including our Teardrop Flag 3 Piece Pole, Teardrop Flag Stand, Teardrop Flag Spiral Ground Mount, Flag Stand Water Weight Bag, and Teardrop Flag Kit Carrying Case. 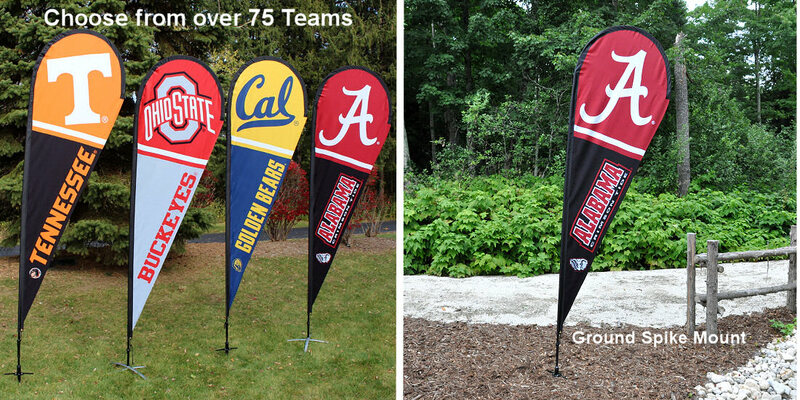 Finally, we will be offering over 75 Colleges and Universities in our College Teardrop Flag line. All are NCAA Officially Licensed by the selected university which ensures authentic school insignias, colors, updated logos, hologram packaging, and top quality.